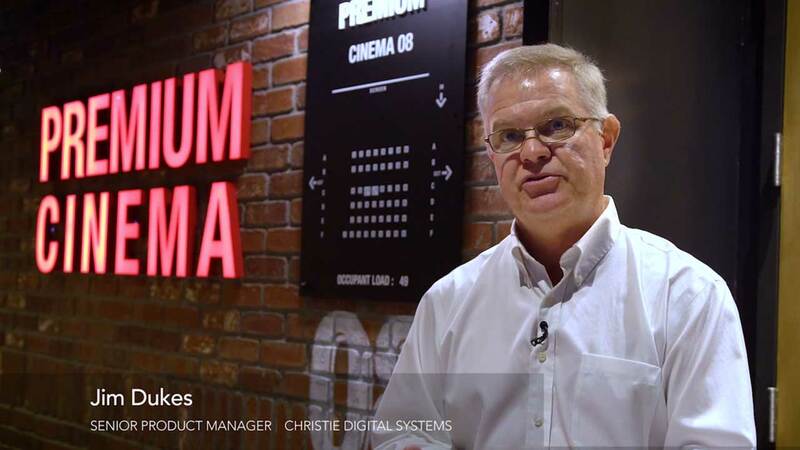 Achieving and maintaining DCI-specified on-screen brightness and color is integral for the quality of the movie presentation and enjoyment of the audience. 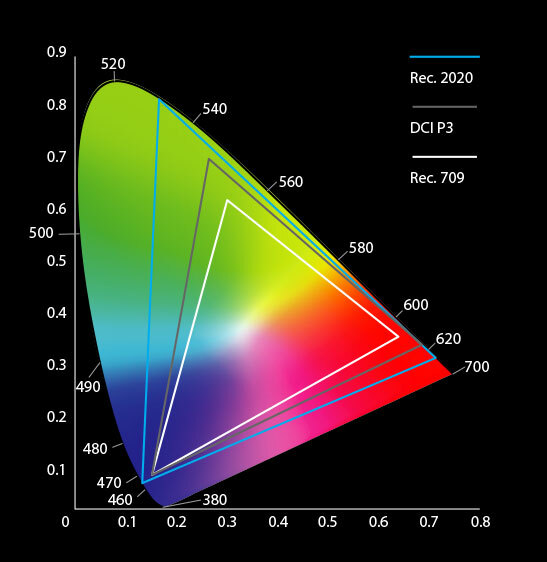 The native color gamut of Xenon lamps is very close to the DCI-P3 specification and does not require much image processing and light filtering. This means content shown using a Xenon projector is bright, colorful and true-to-life. Additionally, once a Xenon lamp falls below presentation quality, a simple lamp change will restore the projector to original brightness. Laser phosphor cinema projectors produce a native color gamut lacking in red and green due to its reliance on only blue laser light. For laser phosphor projectors to achieve DCI-P3 color, a substantial amount of processing and light filtering is required which reduces overall brightness, severely affecting light output and color performance. We explore this more in Fact 5. RGB pure laser reaches 95% of the Rec. 2020 color gamut. With precise, individual red, green, and blue lasers, these projector illumination sources can dial into specific color patterns for visuals that nearly match the perceivable color spectrum of the human eye without sacrificing brightness or adding moving parts, such as a phosphor wheel. Watch this video and find out how Xenon and laser phosphor stack -up when it comes to meeting the DCI standard for color. 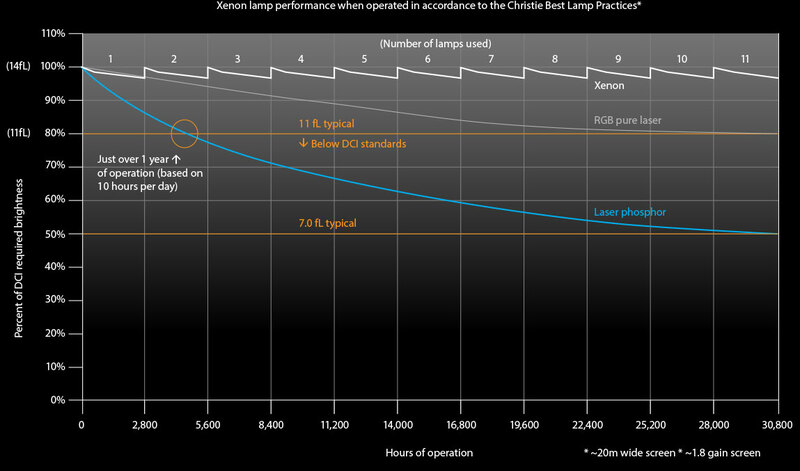 The graph below compares brightness drop-off of the different illumination platforms over 30,000 hours (around 8 years for a typical cinema projector). 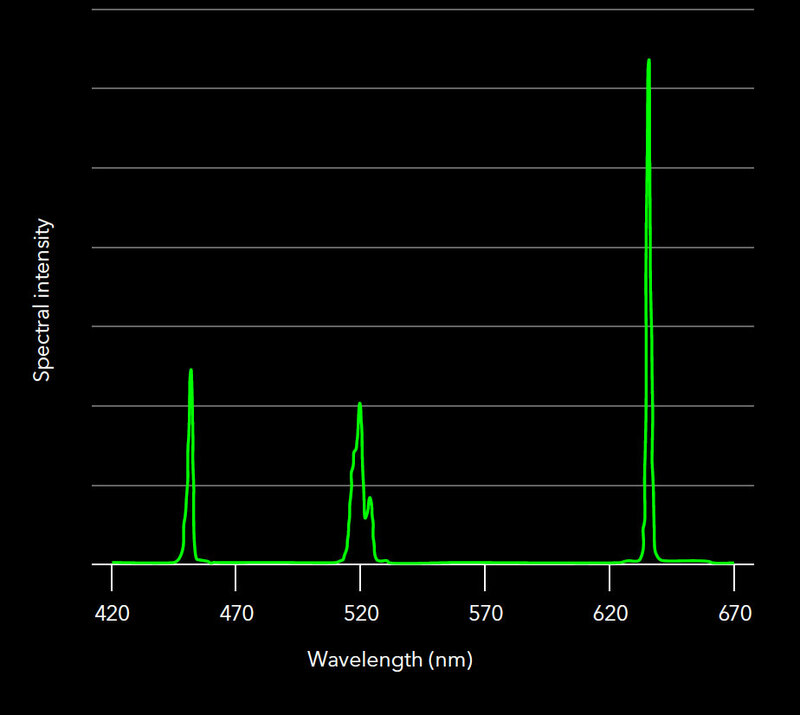 After little over a year, laser phosphor drops below the DCI specification for brightness. 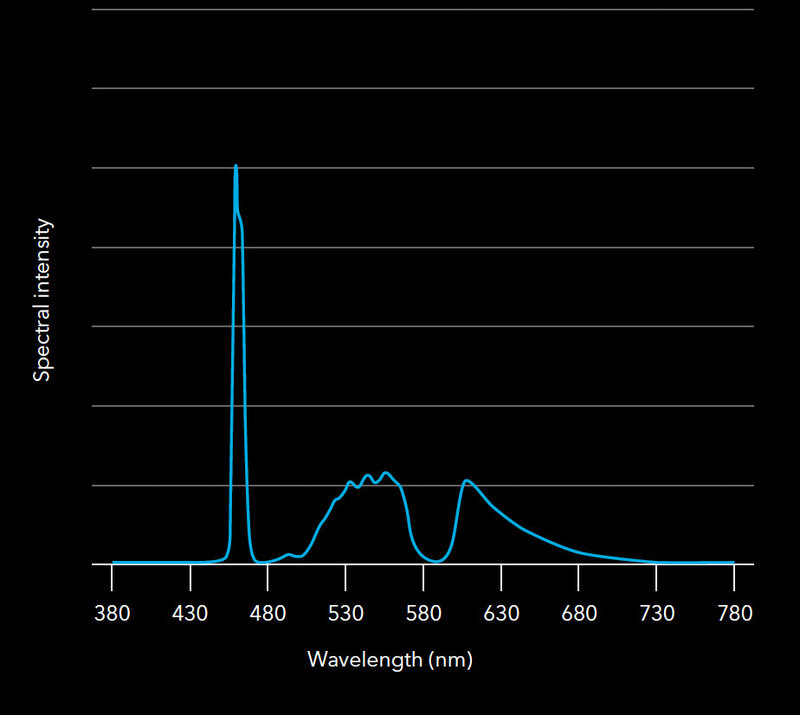 RGB pure laser has a much slower drop-off, maintaining 80% brightness after 30,000 hours. Xenon is the illumination source to lose it’s DCI-P3 rating the quickest; however, the bulbs inside the projector can be easily replaced to bring the system into acceptable range once again. While laser phosphor components can also be replaced to retain DCI color standards, it requires more time and resources to do so. What makes Xenon so well-suited for cinema? 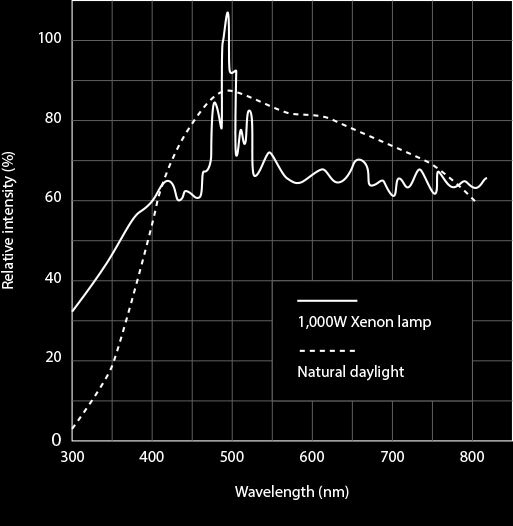 The native light spectrum of a Xenon lamp closely replicates the day light spectrum. Because of this, it can accurately reproduce the natural colors audiences are used to seeing for a realistic and true-to-life experience. 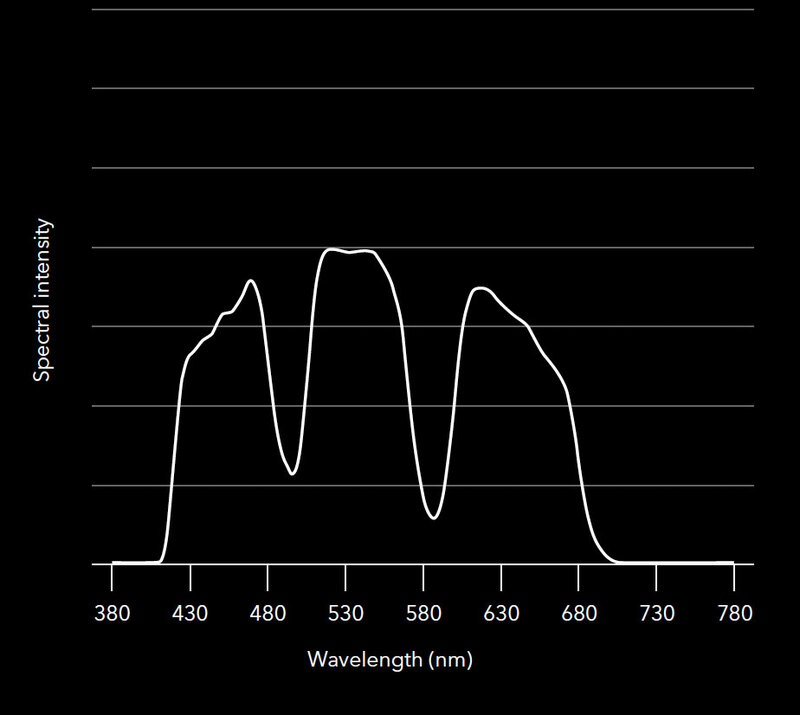 This series of graphs shows each illumination platform’s efficiency in producing the DCI specified white balance. The easier a projector can achieve DCI white without filtering, the more optically efficient the system is. Xenon produces a balanced spectrum of color requiring minimal filtering to achieve DCI white.